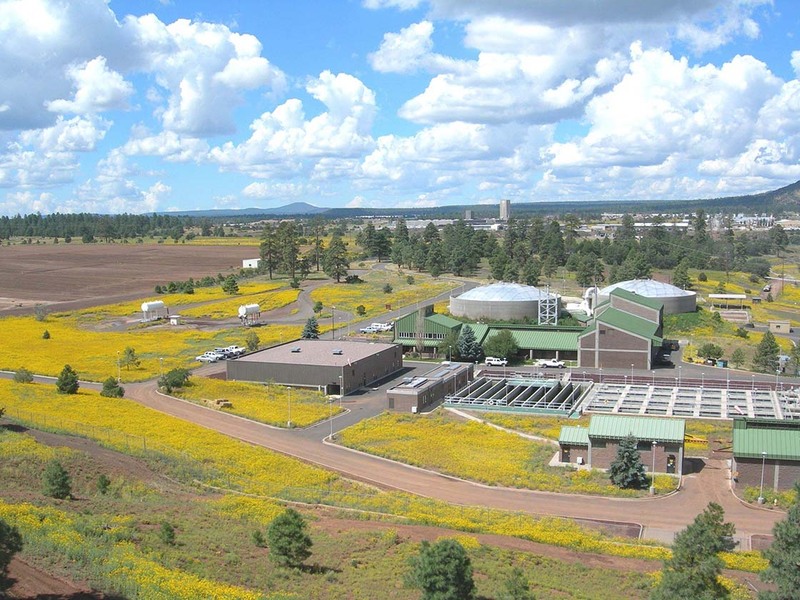 Tata & Howard conducted energy efficiency studies for the City of Flagstaff on their water and wastewater systems. Initial testing showed that modifications to these systems had the potential to save the City approximately $350,000 in annual electrical costs and $445,000 in Arizona Public Power System (APS) rebates if systems were modified with newer technology and upgraded. Pumping systems had efficiencies as low as 5.2% and the wastewater blowers as low as 19.5% where efficiencies of greater than 65% are attainable. Energy usage on the wastewater treatment side per million gallons treated showed 2,170 KWH/MG with cogeneration and 2,804 KWH/MG at the Rio plant. The national average usage is 1,750 KWH/MG. Much of the equipment was oversized to meet peak and future demands but was not efficient at low flows or off-peak flows. From this study and evaluation, the City retained Tata & Howard to provide design and construction administration services for replacing the existing aeration blowers at the Rio De Flag Water Reclamation Plant (WRP). Design services included the layout of the new screw compressors in the existing aeration room, as well as associated electrical, air intake and new piping to the existing aeration basins. The project was completed in December 2017; APS provided a rebate of $83,000 and preliminary annual power savings of roughly $73,200. On the water system, the review included most of the wells, pressure reducing valves, boosters, and zone splits for energy savings. To date, eight (8) facilities have been upgraded, resulting in $256,000 in APS rebates and two of the facilities resulting in $109,000 of annual power costs. The other facilities have not been calculated. The total for both the water and wastewater systems has resulted in $490,000 in APS rebates and power costs savings of greater than $198,000 with additional projects available to extend these numbers. In addition to the power savings and rebates; operations, and reliability of the facilities have improved, and staff has an increased knowledge and awareness of power costs.